In one of the most surprising twists to a comment thread, we had a lively discussion on the All Crime, All The Time post yesterday about baby stroller quality and prices. 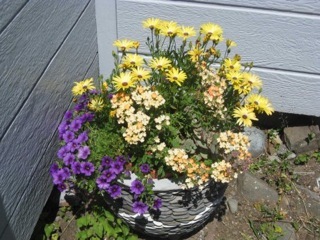 Last night someone stole a flowerpot from our front steps on 56th Street between 1st Ave. N. and Kensington Pl. It is not very valuable, but it is handmade and we really liked it. It is a medium-sized (12″ wide?) concrete pot covered with gray and white pebbles in horizontal bands. I don’t get it – it’s heavy, not fancy, filled with dirt and not even planted. Hard to believe. Hey – this morning at 8:00 AM I saw two suspicious and slightly aggressive looking “homeless” men on Interlake and 37th st. What stood out as suspicious was that they were walking in the street and looking in car windows. One was pushing a grocery cart filled to the rim (he was a white guy, thin build with dark curly hair), the other was black man with a stocky build in a black and red jogging suit that was over-sized on him and he looked much “cleaner” than his homeless counterpart. Both men seemed to be late 20’s early 30’s. They were very out-of-place in this neighborhood – that’s why I’m letting you know. Please tell me you called the police? Alerting the Wallyhood forces of justice is better. Seriously, though, what are the police going to do – arrest them for not looking like typical Wallingford residents? Genuine question, I’m not sure what makes sense here. I’ve been sort of half confronted, a few years back while walking home, through Wallingford on a street that had evidently been getting hit recently with car breakins during broad daylight. I think the gentleman who accosted me might have wondered – of course, I was looking around as I usually do, might well have looked in the direction of car interiors. Whether he was eventually satisfied that I was OK or not, I guess it made no difference to him, since in any case there was nothing he or anyone, including the police, could do about it, but he was at least showing the flag and letting people who wander through know that someone’s looking at them. Maybe that’s the best you can do. Please tell me you DIDN’T call the police. Last I checked, “looking ‘homeless'” is not a crime. It’s the looking in car windows that would set me off. Not illegal. Definitely wouldn’t suggest that they be arrested for it. But I’d feel more comfortable if the police were nearby, and they knew the police were nearby. I agree with you there. It’s not the first time. Just have no idea who to tell -who to alert?! Any ideas? Well Doug, I didn’t say “looking homeless” was a crime, it’s the walking in the street while pushing a stolen grocery cart and looking in car windows that was alarming. No need to be the liberal police here Doug. We all pay through the nose to live in a safer neighborhood. I “pay through the nose” to live near downtown. With that comes an occasional homeless person pushing a grocery cart down the street. Is that something a person casing cars would do? I doubt it. I don’t have a problem with homeless people, if anything I hope they get the help they need. Again, it’s the casing cars – “looking in car windows” esp. on the driver’s side that is very unnerving. If you don’t think so Doug than you must live in a fantasy world where all people are good people and unicorns fart rainbows. We had a flower pot stolen a few nights ago too. Interlake and 46th. Definitely not worth anything, and replaceable- but a little unnerving considering they had to come up the steps all the way to my porch which is far removed from the sidewalk. Wow Amanda- weird! Growing up in NYC we occasionally had plant thefts from the front yard, but it was usually around Mother’s Day !